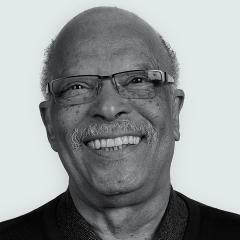 Joe Brooks, Senior Fellow, has been with PolicyLink since its founding in 1999, serving as a senior adviser to the Alliance for Boys and Men of Color team. Prior to working for PolicyLink, Joe held a number of roles across the racial and economic equity field. He was a faculty member of the inaugural black studies departments at two universities: University of California, Berkeley, and San Francisco State University. He edited the Review of Black Political Economy, published by the Black Economic Research Center in New York City. From 1972 to 1984, he was the president of the Emergency Land Fund, saving black-owned land in the rural Black Belt of the southeast U.S. He later served as executive director of the Berkeley, California War on Poverty and executive director of the Rent Stabilization Board in Berkeley. From 1991 to 1998, Joe was a program officer for neighborhood and community development at the San Francisco Foundation, where he founded and directed their interfaith initiative, FAITHS. Joe is a board member of the Oakland Citizens Committee for Urban Renewal (OCCUR), co-chair of the Oakland-based African American Latino Action Alliance, and a board member of the Urban Habitat Program, where he previously served as chair for 15 years. He is a member of the Leadership Council of the Brotherhood of Elders Network, an Oakland, California-based organization with the mission of assisting black boys to thrive. He holds a master’s degree in city and regional planning from the University of California, Berkeley, and a bachelor’s degree in business and economics from San Jose State University. Joe is a mentor to scores of young people, a commentator about politics, policy, and history, and he likes to dance in his spare time.